Saitama Prefecture (埼玉県, Saitama-ken) is a prefecture in the Kantō region of Japan on the island of Honshu. The capital is the city of Saitama. Saitama Prefecture was formerly part of the old Musashi Province. Saitama is in the Kantō region. 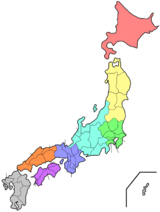 The prefecture shares borders with Chiba Prefecture, Ibaraki Prefecture, Gunma Prefecture, Nagano,Tochigi Prefecture, Yamanashi Prefecture and Tokyo. National Parks are established in about 33% of the total land area of the prefecture. ↑ Nussbaum, Louis-Frédéric. (2005). "Saitama prefecture" in Japan Encyclopedia, p. 808; "Kantō" at p. 479. ↑ Saitama City Profile, overview; retrieved 2012-3-15.